What Cook County Circuit Court race are you looking for? This post will stay on top of the page until after the February 2 primary. Scroll down the page to look for new posts. Click on the vacancy and get information about all the candidates in that race. This map will give you a rough idea of which subcircuit you're in. If you're still uncertain, check your voter registration card or use a site like the "Ballot Builder" on the Chicago Tribune website. For Judge of the Appellate Court (McNulty vacancy), we endorse Arnette R. Hubbard. For Judge of the Appellate Court (O'Malley vacancy), we endorse Pamela E. Hill-Veal. For Judge of the Circuit Court (Berland vacancy), we endorse William H. Hooks. For Judge of the 1st Subcircuit, (Coleman vacancy) we endorse Thaddeus Wilson. For Judge of the 1st Subcircuit, (Steele vacancy) we endorse Sharon Oden-Johnson. I posted last night that the Democratic Party of Evanston endorsed Abbey Fishman Romanek for the Otaka vacancy and Steven James Bernstein for the "A" vacancy in Cook County's 9th Judicial Subcircuit. I linked to the organization website in support of that statement. As my math teachers always said: Show your work. I opened up my email this morning and found several notes telling me to look again. "Take a closer look at the fine print," said one note. Fine print on a sample ballot? That's like footnotes in a comic book -- theoretically possible but (one would suppose) entirely out of place. Candidates in bold face are in contested races and have been endorsed by the Democratic Party of Evanston, having received 2/3 or more of vote of participating members at the 2010 primary endorsement session held by the DPOE on December 13, 2009. All other candidates on this sample ballot are recommended by the Evanston Township Democratic Committeeman, State Senator Jeff Schoenberg. A separate .pdf sample ballot (that I did not look at yesterday) has the same disclaimer at the top of the page, in blue. So... if my middle-aged eyes are correctly distinguishing bold from regular type... Evanston Township has not endorsed any judges. I can see, though, where voters might not catch the distinction. Some of my emailers this morning alleged that this was precisely the intent. I offer no opinion on the topic -- but I do regret my initial misreading. In the meantime, so far as I know, the Maine Township Democratic Organization has actually endorsed Steven James Bernstein for the 9th Subcircuit "A" vacancy and Dennis Michael Fleming for the Otaka vacancy. The Maine Township group has also endorsed Steven J. Fruth in the crowded 11th Subcircuit field, as has the Democratic Party of Oak Park. I had an email this week from Loop attorney Bridget A. Mitchell pointing out that I had not included the endorsements bestowed on her brother, Judge Raymond W. Mitchell, by the 43rd Ward and 49th Ward Democratic organizations in my 'organizing the data' posts. I had mentioned Judge Mitchell's endorsements by those groups when I put up posts about them (they're linked in the first paragraph)... but when I was putting the Hayes vacancy post up, it seemed to me, at that moment, like overkill. After all, once a candidate gets the county endorsement, one would expect the various ward and township organizations to fall into place. The news value would be where an organization failed to hew to the party line, right? According to this card, Wheeling Dems are backing Deidre Baumann over William H. Hooks, Joanne Fehn over John P. Callahan, and Russell W. Hartigan over Sandra Ramos. 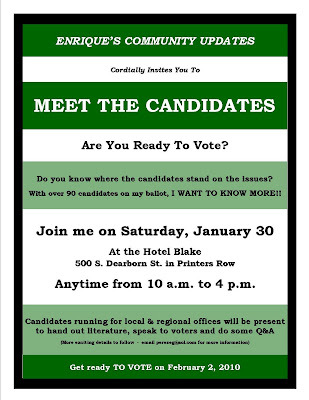 I've received a couple of emails from Enrique G. Perez recently about a Meet the Candidates event he is organizing for tomorrow, January 30, at the Hotel Blake, 500 S. Dearborn. I have no prior acquaintance with Mr. Perez; perhaps a reader will provide some background in the comments. I can tell you, however, that Mr. Perez wrote, "I am not representing or campaigning for any candidate, but I am trying to send out information on as many of them as possible so voters can make an informed decision. I also am not representing any groups, although in my time as a 'community involved person' I have been affiliated with several of them. This venture however is entirely my own." I don't know whether candidates will be available before or after this time slot -- this is the last weekend before the primary and candidates will be trying to be everywhere at once. However if you're in the South Loop tomorrow morning, this might be an opportunity to "eyeball" a lot of judicial candidates all at once. More information about this event, including a list of other candidates for other offices scheduled to appear tomorrow, may be found by clicking on Mr. Perez's name in the first paragraph or by visiting The Chicago Voter. The Chicago Sun-Times is out this morning with its judicial endorsements. The editorial begins, "The most consequential vote you may cast Tuesday -- on behalf of a woman seeking custody of her children, a senior citizen trying to keep his house, or a man facing a death sentence -- is for judge." Hard to argue with that. But, the writer of the editorial laments, "You won't recognize the names of most of the 104 candidates, nearly all Democrats, seeking 24 seats on the Cook County circuit and state appellate court." Gosh. If only the editorial writer knew someone who worked at a newspaper -- a newspaper might cover judicial races so that people would recognize who the candidates were. The saddest part is that the Sun-Times actually has a reporter on its staff who could provide excellent coverage of judicial races... only he doesn't seem to get the chance often enough. I refer to Abdon M. Pallasch, who once reported for the Chicago Daily Law Bulletin. Pallasch wrote about the Democratic Party's judicial slating process back in September; this morning he has an article about Judge James Epstein's television commercial. I understand Pallasch has other duties -- but if the Sun-Times really believes that judicial elections are so "consequential," you'd think he might be given more opportunities to report on judicial contests. Ah, well. People who visit this blog regularly will "recognize" most of the "names" of the Circuit Court candidates -- and know something about every one of them except those few who seem to fly deliberately under the radar. Kathleen G. Kennedy and James Epstein both have received excellent ratings in their bid for the McNulty vacancy, and they stand head and shoulders above three other candidates. We endorse Kennedy, a former public guardian rated "highly qualified" by the Chicago Bar Association. Aurelia Pucinski is a candidate voters will recognize as a former clerk of the Circuit Court, but Judge Thomas L. Hogan has the legal ability that Chicago's lawyers say best qualifies him to fill the O'Malley vacancy. We endorse him over Pucinski and three other candidates. The Chicago Bar Association praised Hogan for "his integrity, legal knowledge judicial experience and work ethic." It's a close call between Judge Mary Katherine Rochford and Judge Sebastian T. Patti, both with excellent reputations, but Rochford gained just a few more "highly" recommended ratings from bar groups. The Sun-Times enthusiastically endorses former criminal defense lawyer William H. Hooks for the Berland vacancy. Hooks, a Marine, a law professor and a litigator in state and federal courts, earned top marks from just about every bar group. Public defender and law professor Terry MacCarthy is heartily endorsed over three worthy opponents for the Bronstein vacancy. Jamaican-born Assistant Corporation Counsel Linda J. Pauel is endorsed over the equally highly regarded Susan Kennedy Sullivan and two poorly rated opponents in the race for the Dolan vacancy. Raymond W. Mitchell, a former attorney at Winston & Strawn who worked on former Gov. George Ryan's defense team, is endorsed for the Hayes vacancy. Attorney John Patrick Callahan Jr. is endorsed for the Kelley vacancy. In a rare Republican primary race, the Sun-Times endorses arbitrator Maureen Masterson Pulia over Michaela Nolan Ryan. Longtime personal injury litigator Russell William Hartigan stands out among seven candidates seeking the Riley vacancy. The Chicago Council of Lawyers praises him as "hardworking, conscientious and knowledgeable." 1st Subcircuit (South Side). Chicago Board of Elections Examiner Thaddeus L. Wilson is the clear choice over Linnae Bryant for the Coleman vacancy. Bankruptcy attorney Jesse Outlaw is the only good choice among five contenders for the Steele vacancy. 3rd Subcircuit (Southwest Side). Former prosecutor and public guardian Allen F. Murphy is the best choice for the Carmody vacancy. David Joseph Coleman, who handles special prosecutions for the Cook County state's attorney's office, gets our nod for the Darcy vacancy. The Chicago Council of Lawyers finds him well-qualified. For an open seat, we choose Daniel Malone, a former personal injury lawyer found "highly qualified" by the Illinois State Bar Association. 9th Subcircuit (north suburbs). Defense lawyer Geary W. Kull is found "highly qualified" for the Otaka vacancy by the Chicago Bar Association for his "legal ability and outstanding temperament." For the other 9th Subcircuit vacancy, Pro Bono Advocates Executive Director Mary Susan Trew is endorsed. 11th Subcircuit (Northwest/West Side). In a crowded field of 11 candidates, Assistant Public Defender Ann Finley Collins stands head and shoulders above the rest for the Riley vacancy, with "highly qualified" ratings from many bar groups. 15th Subcircuit (south suburbs). For the Lipinski vacancy, we endorse Linzey D. Jones, village president of Olympia Fields, who is rated "highly qualified" by the Illinois State Bar Association. For the Panichi vacancy, we endorse state Rep. George F. Scully -- whom the state Supreme Court already has appointed to the bench -- over respected prosecutor Mary Therese Quinn. For the Phelan vacancy, we endorse Judge John C. Griffin. The complete Sun-Times editorial is available here. Related: What Circuit Court race are you looking for? Herewith a list of the judicial endorsements made in contested Cook County judicial races by the Illinois Civil Justice League "through JUSTPAC, the ICJL's Political Action Committee." For a complete list of endorsements made by the ICJL in judicial races across the State of Illinois, visit IllinoisJudges.net. Hat tip to the ICJL's Allen Adomite for providing the information this morning. Avy Meyers has announced a couple of new editions of North Town News Magazine -- extras -- to air before the February 2 primary. The first of these shows has been scheduled to appear on January 30 on CAN-TV (Channel 19) at noon. An air date has not been set for the second show -- but both shows are available now through the North Town News Magazine web site. Candidates for Cook County Circuit Court countywide vacancies interviewed on the programs are Joanne Fehn, candidate for the Kelley vacancy; Deidre Baumann, candidate for the Berland vacancy; and William Burnett Raines, also a candidate for the Berland vacancy (making a second appearance on NTNM this campaign season). Two 9th Subcircuit candidates, both running for the "A" vacancy, are also interviewed. These are William J. Luby and Mary S. Trew. You can watch any of these interviews right now on page two of this blog by clicking on any of the linked candidates' names. Candidates are listed in the order that they appear on the ballot. Information on this post will be updated as time permits until the February 2, 2010 primary. Judge Steven James Fruth is "Qualified" for the office of Circuit Court Judge. Judge Fruth was admitted to practice law in Illinois in 1976. Judge Fruth was appointed to the bench in 2009 and is well respected by his peers for his work ethic and knowledge of the law. Steven J. Fruth graduated from the John Marshall Law School in 1976 and received his license to practice in November of that year. He has been in private practice concentrating in personal injury litigation since 1977. Mr. Fruth is regarded as a well-prepared and hard-working trial lawyer. He is considered to have good legal ability and temperament. The Council finds Mr. Fruth Qualified to serve in Circuit Court. Maritza Martinez is "Qualified" for the office of Circuit Court Judge. Ms. Martinez was admitted to practice law in Illinois in 1989 and has civil and criminal law experience in government service and the private sector. Ms. Martinez has also served as a Hearing Officer in the Court of Claims. Ms. Martinez is active in public service and is well respected for her integrity and work ethic. Maritza Martinez was admitted to practice in 1989. Since 2005 she has been an associate at the Law Offices of Robert Fisher doing criminal defense work. In 2004, she was at a small firm doing insurance defense and catastrophic loss work, and from 1991 until 2004, she was with the City of Chicago Department of Law doing prosecution and civil rights defense. Prior to 1991, she spent two years at a small firm doing real estate work. Since November 2007, she has also served part-time as a hearing officer with the Illinois Court of Claims, conducting trials and making recommendations to the Court of Claims judges regarding the disposition of various claims against the State of Illinois. She also currently serves on the Inquiry Board of the Attorney Registration and Disciplinary Commission. Ms. Martinez reports that she has litigation experience in both state and federal courts, acting as lead counsel in two jury trials in criminal law matters, three juries in civil matters, and numerous prosecutions involving bench trials in municipal ordinance violations. Ms. Martinez is reported to have good legal ability and is considered knowledgeable about her areas of practice. She has had litigation experience in a variety of areas and she is reported to possess a good temperament. She is active in community activities. The Council finds her Qualified for the Circuit Court. Ann Finley Collins is "Highly Qualified" for the office of Circuit Court Judge. Ms. Collins was admitted to practice law in Illinois in 1985 and has served as an Assistant Cook County Public Defender her entire career. Since 1997, Ms. Collins has served in the Homicide Task Force and has tried approximately ninety (90) jury trials. Ms. Collins is highly regarded for her outstanding trial skills, fine demeanor, and dedication to the law. In addition, Ms. Collins has been active in teaching and lecturing at the University of Chicago Law School. Ann Collins was admitted in 1985. She is currently an Assistant Public Defender dealing with homicide cases. As lead trial counsel she has brought 75 criminal cases to a jury verdict and 60 to a bench verdict. 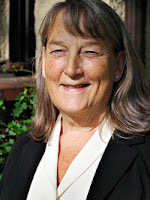 Ann Collins is reported to have excellent legal ability and is praised as a fair but zealous advocate for her clients. She has a professional demeanor and is widely respected as a lawyer. The Council finds her Well Qualified for the Circuit Court. Pamela McLean Meyerson is "Qualified" for the office of Circuit Court Judge. Ms. Meyerson was admitted to practice law in Illinois in 1983 and concentrates her practice in commercial law and civil litigation. Ms. Meyerson is an experienced practitioner and is well regarded for her legal ability and outstanding temperament. Pamela McLean Meyerson was admitted to practice in 1983. Since 1989, she has been a sole practitioner, handling civil and commercial litigation in the Circuit Court of Cook County. She also organizes and advises small businesses. Between 1983 and 1985 she was in private practice at Antonow & Fink and was an associate with Goldberg Kohn Bell Black Rosenbloom & Moritz between 1985 and 1989. She teaches trial practice at the University of Chicago Law School. Ms. Meyerson reports no jury trial experience but has acted as lead counsel in 17 civil law bench trials. Ms. Meyerson is reported to have good legal ability and a professional demeanor. She is respected as a hard-working, knowledgeable, and highly ethical practitioner. The Council finds her Qualified for the Circuit Court. John M. Lagattuta is "Qualified" for the office of Circuit Court Judge. Mr. Lagattuta was admitted to practice law in Illinois in 1985 and worked as an Assistant State's Attorney before entering private practice. Mr. Lagattuta currently serves as an Administrative Law Judge for the Illinois Department of Financial and Professional Regulation. Mr. Lagattuta possesses the requisite qualifications to serve as a Circuit Court Judge. John Lagattuta was admitted to practice in 1985. He spent his initial three years in practice as an Assistant States’ Attorney in Cook County, followed by eleven years of general practice as an associate or sole practitioner handling a variety of civil and criminal litigation as well as real estate and domestic relations matters. 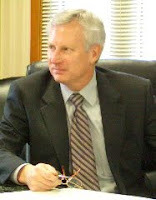 Since 1999 he has held a variety of positions with the State Department of Financial and Profession Regulation, working his way up from a staff attorney prosecuting wayward doctors to the Acting Deputy Director of Statewide Enforcement, supervising approximately 20 attorneys and staff members, as well as handling legislative and policy matters. He has had extensive criminal and some civil litigation experience in his various positions. He is reported to have good legal ability and temperament. The Council finds him Qualified to serve in the Circuit Court. Judge Pamela Leeming is "Qualified" for the office of Circuit Court Judge. Judge Leeming was admitted to practice law in 1990 and served as an Assistant Cook County Public Defender. Judge Leeming has extensive trial and appellate experience and is well regarded for her integrity and fine temperament. Pamela M. Leeming was appointed to the Circuit Court by the Illinois Supreme Court in October 2009. Before becoming a judge, she served an Assistant Cook County Public Defender since her admission to practice in 1990. She concentrated her practice in the areas of paternity, criminal misdemeanor, preliminary hearings, a variety of other pre-and post-trial matters, and appeals. Ms. Leeming is considered to have good legal ability and temperament. The Council is concerned, however, about the lack of breadth and depth in her legal experience, as well as an absence of sufficient experience in more complex litigation matters. The Council finds her Not Qualified for the Circuit Court at this time. Thomas David Bilyk is "Qualified" for the office of Circuit Court Judge. Mr. Bilyk was admitted to practice law in Illinois in 1983 and is currently serving as Chief of the Cook County State's Attorney's Juvenile Division. Mr. Bilyk is well respected for his work ethic and integrity and possesses all the requisite qualifications to serve as a Circuit Court Judge. Thomas Bilyk was admitted to practice in 1983. He is currently the Chief of the Juvenile Justice Division of the Cook County State’s Attorney’s Office. He is a career prosecutor. From 1998 to 2007 he served in the Special Prosecutions Bureau. He has also served as the Supervisor of the Public Corruption and Financial Crimes Unit. He was assigned to the felony trial division between 1987 and 1998. He has extensive litigation experience in both jury and bench criminal law trials. Mr Bilyk is considered to be a very knowledgeable and able prosecutor with a wide variety of experiences in more complex criminal law matters. The Council finds him Qualified for the Circuit Court. Lisa A. Marino is "Qualified" for the office of Circuit Court Judge. Ms. Marino was admitted to practice law in Illinois in 1988 and served as an Assistant Cook County State's Attorney until 1996 when she entered private practice. Ms. Marino concentrates her practice in real estate tax, zoning and land use, and commercial and residential real estate. Ms. Marino possesses all the requisite qualifications to serve as a Circuit Court Judge. Lisa Ann Marino was admitted to practice in 1988. She is currently a sole practitioner focusing on real estate and zoning issues. From 1993 to 1997, she was an Assistant Cook County State’s Attorney in the civil division, real estate tax unit. From 1988 to 1993 she was an Assistant Cook County State’s Attorney where she conducted more than 200 misdemeanor bench trials and traffic offenses, and handled felony financial crime cases. Ms. Marino is considered to be very knowledgeable about her area of practice and she is reported to be a good lawyer with a good temperament. She has experience in more complex litigation matters. The Council finds her Qualified for the Circuit Court. Eugene Joseph Berkes is "Qualified" for the office of Circuit Court Judge. Mr. Berkes was admitted to practice law in Illinois in 1983 and concentrates his practice in litigation, arbitration, and real estate law. Mr. Berkes is well respected by his peers and possesses all the requisite qualifications to serve as a Circuit Court Judge. Eugene Joseph Berkes was admitted to practice in 1983. He is a sole practitioner with a general practice of law. As part of his practice, he serves as an administrative law judge for the City of Berwyn, and is the elected City Clerk for the City of Berwyn. He reports acting as lead counsel in one jury trial, 60 civil bench trials, and 5 criminal bench trials. Respondents consider Mr. Berkes to have good legal ability and to possess a good temperament. The Council is concerned, however, that much of his practice has been involved in less complex litigation matters or in the real estate area. The Council believes a judge must have experience in complex litigation matters before taking the bench. In addition, his practice lacks sufficient breadth. The Council finds Mr. Berkes Not Qualified for the Circuit Court. Kim R. Kardas is “Qualified" for the office of Circuit Court Judge. 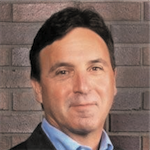 Mr. Kardas was admitted to practice law in Illinois in 1980 and has both civil and criminal law experience. Mr. Kardas is well regarded for his temperament and demeanor and possesses all the requisite qualifications to serve as a Circuit Court Judge. 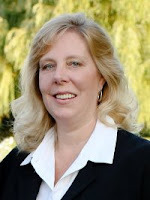 Kim R. Kardas has been a lawyer since 1980. He has been a sole practitioner since 2004, specializing in both criminal and civil litigation. From 1992 to 2004, he was a partner in the firm of Belgrade & O’Donnell, litigating construction defense, maritime, admiralty and product liability cases. He was a Cook County Assistant State’s Attorney between 1981 and 1992 doing juvenile and adult criminal prosecutions. He was an adjunct professor at John Marshall law school between 1991 and 2000, teaching trial advocacy. He has extensive civil and criminal trial experience. Lawyers report that he has very good legal ability and temperament. He is widely praised for being well-prepared and hard-working. He has experience in both the civil and criminal law areas. The Council finds him Well Qualified for the Circuit Court. The candidate declined to participate in the Judicial Evaluation Committee (JEC) screening process and, therefore, according to The Chicago Bar Association's governing resolution for the JEC, is automatically found NOT RECOMMENDED. Mr. Chwarzynski refused to be evaluated. The Council finds him Not Recommended for the Circuit Court. Back to "What Cook County Circuit Court race are you looking for?" Radusa Ostojic, a personal injury defense attorney who was found qualified or recommended by both the Chicago Bar Association and each of the 11 members of the Alliance of Bar Associations for Judicial Screening, has dropped her bid to be elected to the bench from the 11th Judicial Subcircuit. Radusa Ostojic... faced two objections to her petitions. She overcame one attacking the validity of her signatures. However, her other objector Larry Kelly, working for self-appointed political operative Rodney McCulloch, made over 900 claims of fraud against her 669 total signatures in a scattershot attack which [was] upheld by the Cook County Board of Elections. The Board... gave Kelly and McCulloch an extension simply because they failed to appear for the review of Ostojic's signatures by the hearing examiner, which initially found she had enough valid signatures. Without notice to Ostojic, the Board reopened the signature review, which in this case found her to be 89 signatures short of the 500 required for ballot access. By the end of the hearing on Christmas Eve, the Board had restored 75 of these signatures, but refused to give her a similar extension to rehabilitate any signatures. McCulloch received special treatment from the Board of Elections despite having been convicted just last year of perjury and election fraud by falsifying signatures on a candidate's petition. According to Ostojic, "Even Chairperson [Daniel] Madden was shaking his head in disbelief that my signatures were objected often stating the signatures on my petition are exactly the same as on the voter registration card." Sadly, Ostojic has no money to go to court, and no time left to raise funds to continue the fight. Ostojic said, "If the point of democracy is to give people the voice to choose a candidate, that opportunity and right has now been taken away." In an email to FWIW today, Ostojic noted that Kelly was represented before the Electoral Board by John W. Chwarzynski, himself an 11th Subcircuit candidate. Free and Equal, Inc. suggests that the petition/objection process should be scrapped in favor of a filing fee system. Illinois "is only one of three states that uses" the petition/objection system, according to Tobin. "Meanwhile," she writes, "over two-thirds of the states simply require a filing fee to enter a party primary." This, Tobin suggests, would both save costs of administration and provide a new source of state revenue. Sounds rather odd, doesn't it? One might think that if a group was going to pick certain candidates to support, that group would want to publicize its selections to all and sundry. But it doesn't seem to work that way. Only some groups -- e.g., the IVI-IPO or the Chicago Federation of Labor -- posted their endorsements on line allowing me to easily obtain and publicize their choices. Other groups -- e.g., the Advocates Society, or the Chicago FOP (Fraternal Order of Police Lodge No. 7), or the Chicago Fire Fighters Union Local 2 -- publish endorsement lists even though these are not necessarily posted on the groups' websites. Eventually someone has let me know about these groups' endorsements so I could publicize their choices, too. Sometimes, as with this year's list of endorsements by the Illinois Committee for Honest Government, I might get hold of a group's endorsements before the list goes up on the group's website. But then there are groups that make endorsements, who tell the happy candidates -- and don't seem to tell anyone else (except for, I assume, a mailing or an email blast to their respective memberships). The candidates publicize the endorsements on their websites -- and those judicial candidates want me to publicize those endorsements here, too. This creates a problem for me. I had this problem when I covered the 2008 judicial primary, and I wrote about it then, too. It's not that I don't believe that the candidate in question has indeed garnered these endorsements. I believe. Other campaigns are sending me similar emails. Just to cite one more example, Peter Finocchiaro wrote me recently to advise that his candidate, Tracey J. Stokes, had also received an endorsement from the Italian American Police Association. He even sent me a .pdf copy of the letter. But I don't know who else, if anyone, may have been endorsed by that group and I haven't been able to find out. Voters who are comparing candidates can still see all the endorsements claimed by candidates on the candidates' own websites. The point is, though, that I don't want to post any endorsements from a group unless I can post all the endorsements from that group. John C. Griffin is “Qualified” for the office of Circuit Court Judge. 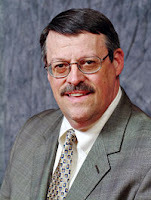 Mr. Griffin was admitted to practice law in Illinois in 1976 and has a wide range of civil litigation experience. Mr. Griffin has an outstanding demeanor and possesses all the requisite qualifications to serve as a Circuit Court Judge. Judge John C. Griffin was admitted to practice in 1976. For 31 years he was in private practice primarily handling real estate, zoning and development-related matters. In March 2008, he was appointed by the Illinois Supreme Court to a judicial vacancy. He has served in Traffic Court and currently presides over mortgage foreclosure matters in the Foreclosure/Mechanic’s Lien Section. Judge Griffin is reported to have good legal ability and an excellent temperament. He had a good reputation as a hard-working and knowledgeable attorney and is praised for his courtroom management skills and for being well-prepared. The Council finds him Qualified for the Circuit Court. Carl Evans, Jr. is “Qualified” for the office of Circuit Court Judge. Mr. Evans was admitted to practice law in Illinois in 1993. Mr. Evans possesses all the requisite qualifications to serve as a Circuit Court Judge. Carl Evans, Jr. has been a lawyer since 1993. He has been a sole practitioner for most of his career, concentrating in criminal defense and personal injury work. He has been an adjunct professor of law at John Marshall Law School since 2001, teaching legal writing, research, and oral advocacy for first-year students. He is considered to have good legal ability and an excellent demeanor. He is praised for being exceptionally hard working and well-prepared. The Council finds him Qualified for the Circuit Court. Nichole C. Patton is “Not Recommended” for the office of Associate Judge. Ms. Patton was admitted to practice law in Illinois in 1997. While Ms. Patton has an interesting and diverse legal background, at this stage of her career she does not possess the requisite depth and breadth of experience to serve as an Associate Judge. (Note in CBA Green Guide: "Pursuant to Section 27.4 of the JEC Resolutions and Procedures, a candidate who has been evaluated and found 'NOT RECOMMENDED' for the office of Associate Judge and who shall within two years of such a finding be a candidate for Circuit Judge shall be found 'NOT RECOMMENDED' without hearing." Nicole Patton was admitted to practice in 1997. 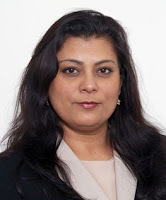 She is currently a sole practitioner and was an Assistant Cook County State’s Attorney having practiced in the areas of real estate taxation, delinquency, child protection, traffic, and appeals. She reports acting as lead counsel in 1 civil jury, 5 criminal juries, 200 criminal bench trials, and 100 civil trials. She has handled 25 cases on appeal. Ms. Patton is considered to have good legal ability and temperament and has the reputation of being a good attorney. The Council is concerned, however, because while Ms. Patton has litigation experience, little of it is in more complex matters. She has the potential for being a good judge but the Council believes she is not yet ready for the bench. The Council finds her Not Qualified at this time. Thomas "TJ" Somer is "Qualified" for the office of Circuit Court Judge. Mr. Somers was admitted to practice law in Illinois in 1991 and has broad experience in both civil and criminal law. Mr. Somers is well respected for his legal knowledge and ability, integrity, and fine temperament. Thomas Joseph “TJ” Somer was admitted to practice in 1991, following 14 years as a police officer in Chicago Heights. After one year working on insurance defense cases for a large firm, he set up his own general practice firm in the south suburbs. Since 1997 he has served as a Supervisor for Bloom Township and, since 2006, he has also served as corporation counsel for the city of Chicago Heights. He was also an unsuccessful candidate for mayor of Chicago Heights and for Congress. Mr. Somer is reported to have good legal ability and temperament, although his practice is narrow. In addition to the narrowness of his practice, the Council is also concerned that Somer was a defendant in a law suit alleging illegal practices with respect to tax delinquent properties during the time he was the Bloom Township Supervisor. Although the trial court absolved Somer of wrongdoing, the Appellate Court reversed the trial court’s decision. Mr. Somer denies any culpability and insists that this program was appropriate and successful. The Council finds him Not Qualified for the Circuit Court. Mary Beth Duffy was admitted to practice in Illinois in 1992 and has been a Cook County Assistant State’s Attorney since 1996. She is currently prosecuting felonies as a “First Chair” prosecutor in the Markham courthouse. She has extensive bench and jury trial experience. Ms. Duffy has good legal ability and a good temperament. She is considered to be hard working. The Council finds her Qualified for the Circuit Court.